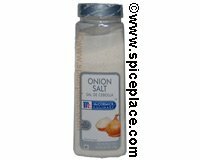 This is a professional chef size container of McCormick Onion Salt. Onion has many varieties that differ in shape, size, and flavor. All onions share a pungency and bittersweet taste that can be mild or powerfully sharp. The aroma of many types of onion is so strong it makes the eyes water, a quality lost in the cooking processes where onions obtain a mild, sweet flavor. The onion belongs to the lily family and is believed to be native to Southwestern Asia. Usage Tips: Add 1 tsp Onion Salt to 2 cups cooked vegetables. Use Onion Salt to season stuffed eggs, potato, egg, chicken or salmon salad. McCormick® is a Registered Trademark of McCormick and Co, Hunt Valley, MD 21031. Ingredients: Salt, Onion, Sodium Silico Aluminate (Added To Make Free Flowing) and Onion Oil.